Instagram will follow its parent company Facebook in reviewing accounts belonging to Britain First leaders Paul Golding and Jayda Fransen. Britain First is an extreme far-right organisation which was founded by religious fundamentalists. Twitter has already banned the pair and Britain First as part of a rule change about accounts affiliated with hateful activity offline. US president Donald Trump recently retweeted Jayda Fransen, earning widespread political condemnation in the UK. Instagram will review accounts belonging to Britain First leaders Jayda Fransen and Paul Golding, after rivals Twitter and YouTube took action against the pair. A source with knowledge of the matter told Business Insider that Instagram would follow the example of its parent firm Facebook and review the accounts. Facebook’s European policy chief Simon Milner told British politicians on Tuesday it would review the pair’s Facebook accounts. A review doesn’t automatically mean Instagram will ban Fransen or Golding outright. Both have “official” accounts on Instagram, linked from the Britain First website and boasting thousands of followers between them. 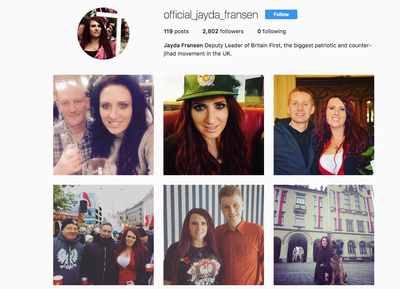 Britain First deputy Jayda Fransen has 2,802 followers, while leader Paul Golding has 991. Britain First itself does not appear to have an official account. The accounts which pop up under a search for Britain First mostly show private Instagram accounts with few followers. Britain First has been described by prime minister Theresa May as a “hateful” organisation. It is the main far right group in the UK. The group’s social media activities are under particular scrutiny after Jayda Fransen posted several anti-Islamic videos and was then retweeted by Donald Trump. He was condemned across British politics, but Britain First’s leaders were overjoyed by the attention. Fransen changed her Twitter profile header image to a photoshopped picture of her with Trump. Twitter subsequently banned Fransen, Golding, and Britain First as part of new rules taking stricter action against accounts affiliated on or offline with hate speech or hateful conduct. YouTube has also placed restrictions on some Britain First videos, though the material is still available. Neither Facebook or Instagram appear to have similar rules to Twitter about banning accounts based on offline hateful activity. And both Fransen and Golding have been largely careful about avoiding anything that is obvious hate speech. Fransen and Golding launched a petition after being thrown off Twitter, demanding the firm reinstate their accounts. The two have also joined Gab, a little-known social network that professes to stand for all free speech but is particularly popular with fringe right-wing users.